OK, the TWSBI Diamond pens are not very new pens but I’m reviewing them because of their popularity. Yes, TWSBI pens are pretty popular for their pretty designs and reasonable prices. 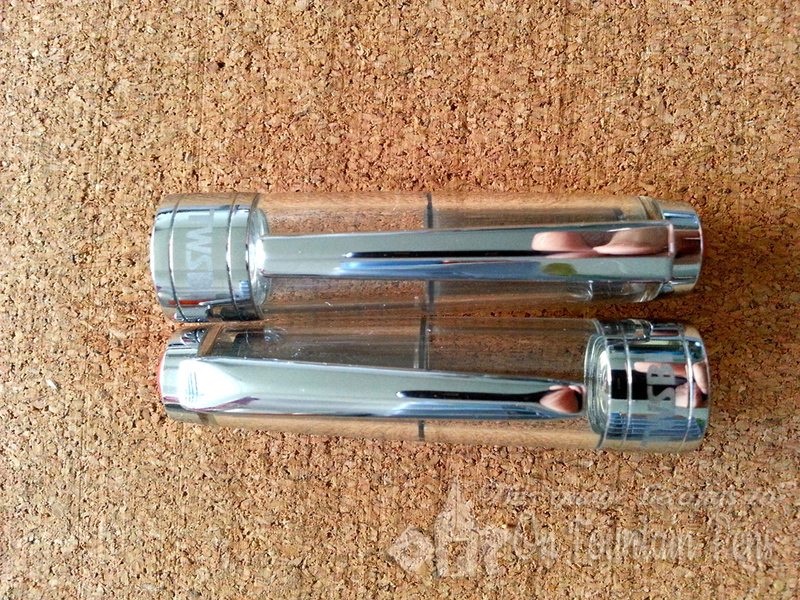 Here I will review the TWSBI Diamond 580 and the TWSBI Diamond 530, the only two TWSBI pens which I have at this moment. For those who didn’t know what TWSBI is: it is a Taiwanese fountain pen brand, and I think you can pretty much count on Taiwanese brands to provide good quality products. The name TWSBI is created in an interesting way – TWS is the backward initials of sān wén táng “三文堂”, which is Chinese for “Hall of Three Cultures”, while BI is the Chinese pinyin of 笔 (pen). Pretty grand! In English I suppose the most instinctive way of pronunciation would be something like “twis-bee” (rhymes with frisbee), thus the frequent misspelling of “Twisbi”. I have two TWSBI pens, the 580 and the 530. The 580 is the improved version of the 540, which in turn is the improved version of the 530. I don’t have a 540, but many who do have mentioned that there hasn’t been much noticeable difference between the 540 and the 580. The Diamond 580, however, has had some slight modifications to the original 540 design, intended to improve the durability of the pen. e the plastic section and prevent cracking, and some say, provide some grip while holding the pen. To me, I’ve been taking care of my TWSBIs very well, so it hadn’t made a huge difference. Also, I don’t hold all the way down to the metal part, so in terms of grip, I didn’t feel any difference. There is also a metal trim ring added at the piston end of the pen and the inner metal sleeve removed, also to reinforce the plastic barrel and prevent cracking. Likewise, I hadn’t experienced any cracking of my pen, so it did not make a huge difference to me, but it is comforting to know that it should be more durable and will minimize any cracking accidents that might occur. The caps of the 2 pens have also had a difference in the clip. In the old Diamond 530 clip, the metallic bevel runs constantly throughout it, while for the TWSBI Diamond 580 clip, the bevel ends in a Y-shape, making it that very slightly more appealing. It kind of reminds me of expensive cars and their elegant metallic trims. All TWSBI Diamond pens have screw-on caps, and they close very firmly indeed. Both the 530 and the 580 caps open up with 1 1/4 revolutions (approximately), so you don’t need to spend ages unscrewing them just to jot down a couple of words! The only downside I can think of is that the caps do not have something like a click-to-tell-you-that-it-is-fully-closed mechanism. While many screw-on caps don’t have such a thing, the TWSBI Diamond caps in particular could be further screwed tight by brute force, which I dare not experiment with, for fear of cracking the whole thing. It thus makes one unsure of whether this amount of tightening is actually sufficient to seal the pen or not. Coming to the nib: I like the TWSBI nib due to its nice design, and on it there is the TWSBI logo engraved. The TWSBI logo looks really nice on the nib itself although I don’t like it in red at the top of the cap. The splash of colour seems to make the pen look slightly cheaper and less elegant, if you know what I mean. It may have done better using a more subtle colour instead. 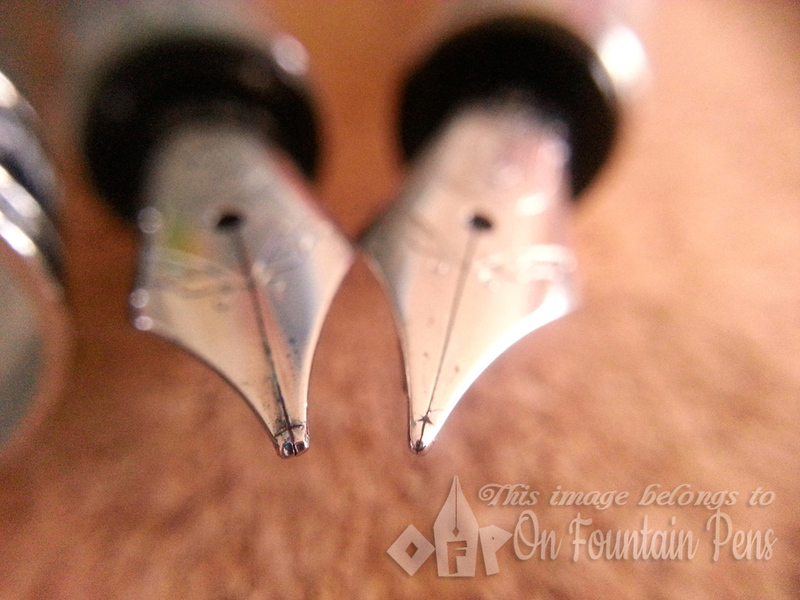 On the TWSBI Diamond 580, the nib size is engraved in the middle of the base of the nib, below the TWSBI logo (left, EF). 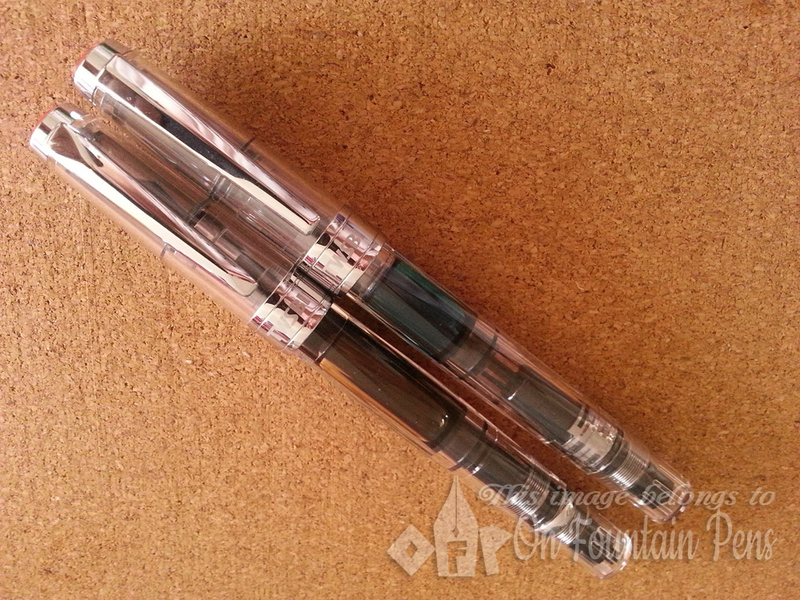 On the TWSBI Diamond 530, the nib size is indicated on the side of the nib (right, M). I suppose many pens have the nib size indicated in the middle, like with the Diamond 580, so it is easier to find it, while putting it at the side (like with the Diamond 530) makes it more subtle. I don’t really have a preference on this, it is hardly important to me. Even though I had an M nibbed 530, I had gotten it ground into a 0.7mm stub by one of my fountain pen mates when I bought it from him about 2 years ago. I can’t really use this nib to judge the writing quality of the TWSBI nib. However, with the EF sized 580, you could experience some feedback due to the fineness of the nib. This, I am fine with, but when it comes to scribbling things down quickly, you wouldn’t want so much feedback on the nib. That could be sorted out by smoothing it out, but I choose not to touch it for now. Overall, the TWSBI Diamond pens can be everyday writers in my everyday carry pouch. They are reliable, sturdy pens with large ink capacities, allowing you to write more between refills. What’s more, being a transparent pen should help in ensuring a thorough wash when you change inks! I do recommend everyone to have at least one of these. They’ve also come up with the TWSBI Mini, which is the pocket-sized version for those who prefer smaller pens. Hey dear Readers, I am finally back from my two-week Spain and France trip! New poll: How often do you write by hand a decent amount of stuff (at least half a page)? Thanks for the compliment! Glad you liked it. Good comparison. I always wonder what’s the difference between the two. 580 cant be posted right?? It can, but awkward I think. I have a 580, but have never tried the 540 or 530. Is it a noticeable difference between them? Hello! Other than a bit of design differences, they pretty much feel like the same pen while writing. hey there that sounds cool! do you know where i can buy one in singapore? Hi! Thanks for commenting. You can look for Straits Pen Co.